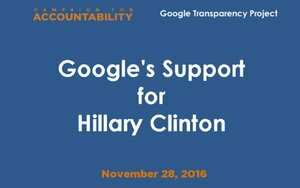 Campaign for Accountability (CfA), a 501(c) project that uses research to expose misconduct in public life, released a report Monday detailing Google’s support for Hillary Clinton. It noted how executives at the company hoped to extend its influence into the next administration. The review shows at least 57 Google or related employees were affiliated with Clinton in her presidential campaign, in her State Department, at her family foundation. The report suggests Google also spent heavily wooing Republicans. About 10 people who worked under Clinton at the State Department later joined the New America Foundation, a Google-friendly think tank where Google Chairman Eric Schmidt supported the foundation as one of its top donors. What can marketers expect from Google when it comes to the incoming political administration? Although it's too early to tell, mostly because the administration is less liberal, the report provides insight into ways a "corporation can influence our democracy beyond simple financial donations." One way points to the list of former Google executives working for the Clinton campaign, such as Stephanie Hannon, Clinton's chief technology officer; and Osi Imeokparia, Google's chief product officer. Two other staffers included Derek Parham and Jason Rosenbaum. Google-connect companies also played a role. Civis Analytics and The Groundwork, two companies that compile data and polling on voters for the campaign, were funded by Google's Schmidt. The Groundwork was responsible for building data, analytics tools and infrastructure to target voters for fundraising, advertising and outreach, according to the CfA. Hillary for America paid the company more than $590,000 for technology services from July 2015 through Sept. 12, 2016, according to FEC disclosures. But despite the company's support of Clinton, the company may benefit from a Trump administration, per the CfA. "Joshua Write, a former FTC commissioner, could return as chairman, for example," per the report. "Wright is currently at Google's main antitrust law firm, Wilson Sonsini, and previously wrote Google-funded papers arguing the company should not face antitrust action." The report names a long list of possibilities, all of which would benefit Google even in the new administration. 5 comments about "Report Reveals Google's Support For Hillary Clinton". Craig Mcdaniel from Sweepstakes Today LLC, November 28, 2016 at 7:11 p.m.
Hey Google, read this... One of your Indian employees called me over 4 years ago to tell me I had to change my website to Google's New Website Standards with only 2 banners above the fold and in certain locations above the fold. Many years before it was Google who came to me to say to put 3 Google AdSense banners above the fold and Google would pay a higher rate. Well Google lived up to their promise and did pay us. So years go by then I get calls, emails, threats and more if I didn't follow this Indian Snake Charmer's rules. One of the threats was also to take down a competitor's banner. I am not an attorney but I do know and understand anti-trust laws. I didn't think this was right be Google to be a part of this crime against competitors so I told snake Charmer to go "F**K Himself". No joke, this was serious. My loses over everything Google took away from me I place at over $300,000 in value. This included attacking my Google Search ranking from first page, first spot down to over page 27. Google, you can attack me but you will not break my will. Google, had you come to me and worked with me like before, I would be upset. But it is clear Snake Charmer and his team in India set out to make me as an example. Google, big mistake. So Joshua Write, Stephanie Hannon, Osi Imeokparia, Google Chairman Eric Schmidt and the rest of Google's management, you can run and hide but I can can't stop me from turning this over to Trump's new attorney general's office. Gautam Peri from An agency replied, November 29, 2016 at 11:17 a.m.
My guess is that the Indian employee's English was better than yours, you racist putz. Chuck Lantz from 2007ac.com, 2017ac.com network replied, November 29, 2016 at 12:51 p.m.
Mr. Mcdaniel; Your post leaves me just a bit confused. Are you angry at Google, or at the entire nation of India? Or both, maybe? And why would a snake-charmer be contacting you? ... oh, wait. ... never mind. Craig Mcdaniel from Sweepstakes Today LLC, November 29, 2016 at 1:48 p.m.
Google hired a bunch of English speakers in India. I am not confused when one of their employees told me a number of times to take down competitor banners. Besides being flat wrong for Google to ask me to take down competitor banners, I understood after asking an attorney whether if this action was legal on Google's part. The answer was no. More importantly, I had no plans to hurt a another client because because of Google's desire to eliminate one banner or more at a time from many websites. I will not sell out my personal values, my other banner clients nor break the anti-trust laws for anyone. As for India, that's Google's right to hire employees there. However in the context of Mrs. Clinton's being a part of this story, maybe the question should have been why she didn't ask that Google to keep those jobs in America so American can talk with other Americans? These are customer service jobs, not rocket engineers. Many American need jobs here don't you agree? So yes, I do have a problem with Google. Chuck Lantz from 2007ac.com, 2017ac.com network replied, November 29, 2016 at 5:02 p.m.
... as well as a problem with the lack of an "edit" function in this comments section. I feel your pain. On the other hand, I'd be willing to bet that there is a group of English-speaking Google employees in India who are howling in laughter right now. I feel that, too.